So while we might talk about your ‘S Corp’, or ‘S Corp Taxes’, we are truly talking about your underlying entity being treated as an S Corp for taxation. Again, this is a common misconception… no biggie if you thought otherwise. A common complaint from those who own their own business is self-employment tax. Can you avoid, reduce, eliminate or lower your self employment taxes or SE taxes? Yes, to a large extent actually but it takes some effort and an S Corp Election. Bottom line savings is about 8-10% of your net business income after expenses. So, if you make $100,000 after expenses you’ll save about $8,000 in overall taxes, and they are all self-employment taxes. 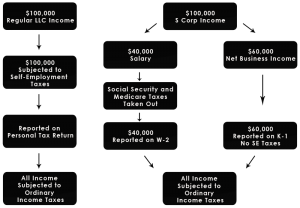 Self-employment taxes = Social Security / Medicare taxes = payroll taxes. All the same thing (in general). There is a cost to being an S corporation of course- all that glitters is only partial gold. See below for our S Corp “all in” packages aptly named Aspen, Vail, Breckenridge and Keystone. Yup, we’re from Colorado! So, when your partnership, LLC or corporation is being taxed as an S Corp you are both an employee and a shareholder (think investor). As an employee, your income is subjected to all the usual taxes that you would see on a paystub- federal taxes, state taxes, Social Security taxes, Medicare taxes, unemployment and disability. However, as a shareholder or investor, you are simply getting a return on your investment much like a dividend (in S Corp world this is called a distribution). A K-1 is a statement that each shareholder receives, and it is similar to a W-2 since it reports the income that each shareholder is responsible for from a taxation perspective. There are two types of K-1s for the purposes of our discussions- one is generated from a Form 1065 and the other is generated from a Form 1120S. A Form 1065 is also called a partnership tax return, and typically your K-1 will be subjected to self-employment taxes. However, a K-1 generated from a Form 1120S (an underlying entity with the S Corp election) is reported on the shareholder’s personal tax return on Schedule E, Page 2. Schedule E is the form used for rental properties, royalties and other investment income including business income from an S corporation. And when we say self-employment taxes, we are really talking about Social Security and Medicare taxes. From a sole proprietor perspective, they are self-employment taxes. 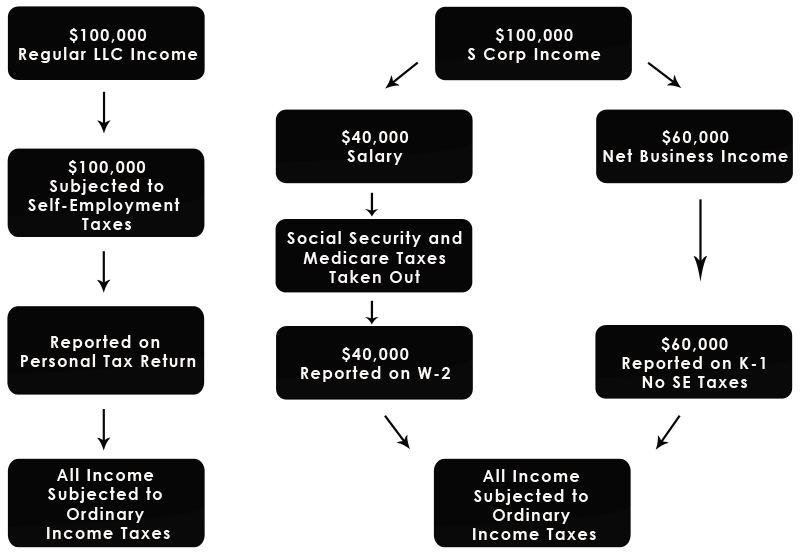 From an employee perspective, they are Social Security and Medicare taxes (FICA). Same thing. How does all this S Corp election stuff work? Let’s schedule a time to chat! The Watson CPA Group offers expert small business consultation in-person, by telephone or via Skype. We love to Skype- faces, inflections, all the good stuff for our long distance clients. Heck, even people in the same building seem to prefer a phone call or Skype. Our fee is $150 for 40 minutes. If we decide to press forward with an engagement, we will credit the $150 towards future services like filing Form 2553. If you don’t need convincing and already want our services such as business tax return preparation or S Corporation subscription, and you simply have some housekeeping questions, we answer those at no charge. Charging a consult fee to tell you how great we are is not cool. Do you have other partners besides a spouse… business partners, that is? Say No. If you say Yes, are you currently splitting income based on ownership percentages or some formula? If you say Formula, then we’ll need to explore a multi-entity arrangement. Please contact us today to get started on electing S-Corp status! All the cool kids are doing it- well, most, and we’ll have to ask several questions to make sure the fit is right.